Apocalypse is a genius, a level of which humanity cannot comprehend and has knowledge of certain areas of biology, primarily genetic engineering and mutation, and technology that are far in advance of contemporary science and technology. Enhanced Abilities: Apocalypse has vast super human strength, endurance and durability. Size Alteration: Apocalypse is able to change his size at will; he can increase or decrease the size of his body by taking on additional mass or ridding of it from a presumably extra-dimensional source. Invulnerability: Apocalypse is virtually impervious to harm, although it is now possible (after his original body was destroyed) to cause him injury that would not be immediately regenerated by his power. Flight: Apocalypse can enable himself to fly, by either transforming his arms into wings, jets, or through telekinetic use. Teleportation: Apocalypse can teleport himself and others around vast distances across the planet. Bio-Molecular Alteration: Apocalypse has total control over the molecular structure of his body and can alter it at will, allowing him to shape change and elongate with virtually unlimited range, to increase his density and allow his body to mimic metals and armours, and to be virtually immune to the effects of age. Energy Generation: Apocalypse has the ability to generate energy for a number of effects, including but not limited to: Energy Absorption, Superhuman Speed, Force-Fields and energy projection. Telekinesis: Apocalypse possesses telekinetic abilities enabling him to levitate oneself or that of others by sheer force of will and manipulate living beings, inanimate objects and to some extent energy psionically. Immortality: Apocalypse's original body was immortal, even before being modified by the Celestial ship, he had lived for thousands of years. 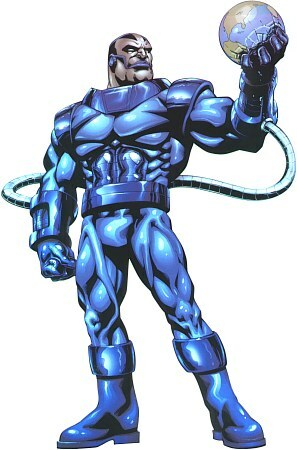 Apocalypse can enter a coma-like state of suspended animation during which he may recover from any wounds with the assistance of his Celestial technology. Celestial Technology: Several of Apocalypse's bases have a rejuvenation chamber. Apparently Celestial technology capable of manipulating the genes of mutants giving them altogether new abilities or augmenting the ones they already possess. Apocalypse was born nearly five thousand years ago on the outskirts of Egypt. Fearing that the grotesque infant was a demon, his tribesmen abandoned him in the desert. A raider named Baal rescued and adopted the strange baby, seeing in him ‘a God in the making’ Baal named the child ‘En Sabah Nur’ and raised him to believe that only the strong were worthy of survival. Believing that he was destined for greatness, En Sabah Nur laboured as a slave in the Pharaoh’s city, waiting for his opportunity to overthrow the ruler. But Pharaoh Rama-Tut, who was in reality from the far future and had travelled back in time to find Apocalypse and enslave him, discovered Apocalypse first. When Nur defied Rama-Tut’s orders, the Pharaoh cut him down with a weapon from the future. But En Sabah Nur did not die; rather, his full powers were unleashed. Apocalypse proved to be even more evil than the tyrant he intended to overthrow. For Millennia he roamed the planet, encouraging civilizations to worship him as a god, and testing their strength by manipulating them into fighting wars of conquest. Today, he has reappeared yet again, believing world conquest to be at last within his reach.